Frances Hartley, wife of John Barton, died on this date 101 years ago. She was born 9 April 1839. Frances was buried in Sardis Cemetery; Bibb County, Georgia. Elise Moody Calhoun died on this date 40 years ago. She was born 6 October 1910. Elise was buried in Sardis Cemetery, as well. Crawford V. Watson died on this date 95 years ago. He was born 20 November 1885. Crawford was buried in Magnolia Park Cemetery, Warner Robins, Houston County, Georgia. For more information about Mr. Watson, please read an earlier post - Crawford V. Watson: One of the Best Known. 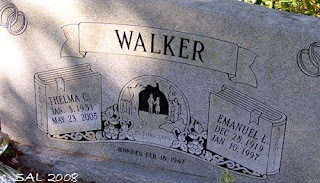 Emanuel L. Walker died on this date 12 years ago. He was born 28 December 1919 and married Thelma 18 February 1947. Mr. Walker was buried in Bonaire Cemetery; Houston County, Georgia.